Signature Lounge ANA Suite Lounge (Tokyo); U.S. lounge locations: Chicago (ORD), Honolulu (HNL), Houston (IAH), Los Angeles (LAX), New York (JFK), San Francisco (SFO), San Jose (SJC), Seattle (SEA), and Washington (IAD). ANA makes it challenging to earn miles from its co-branded credit cards. The airline currently only has 1 credit card for U.S. travelers that earns ANA miles. The one credit card that you can apply for is through First National Bank of Omaha. But with a low sign-up bonus, we recommend passing on this card for now. Marriott-SPG credit cards are the best ways to earn points that can be transferred directly into ANA miles. What’s great about earning these points is that for every 60,000 points you transfer to an airline partner, you’ll receive 5,000 bonus points. 60,000 points will mean you’ll have 25,000 airline miles (3:1 transfer ratio + 25% bonus) to use for your next redemption. American Express cards are another great way to earn points that can be transferred directly into ANA miles. Amex has a number of valuable partners including ANA, and they regularly offer bonus miles when transferring points to airline partners — further increasing the value of the points you earn. ANA’s loyalty program is called Mileage Club, and the miles you earn are called Mileage Club miles. Miles can be earned by flying on ANA, Star Alliance, and partner airline flights. You can also earn ANA miles by spending with its non-airline partners, which include hotels and rental car companies. When the time comes to redeem ANA miles, you can use your miles to fly on ANA and its partner airline flights. ANA miles can also be redeemed with the airline’s car rental, hotel, and other travel partners. Enrollment in the ANA Mileage Club program is easy! Simply complete this form and ANA will provide you with your frequent flyer profile and number. After enrollment, you will earn ANA miles by flying on ANA or its partner airline flights, and also by spending money with its partners. 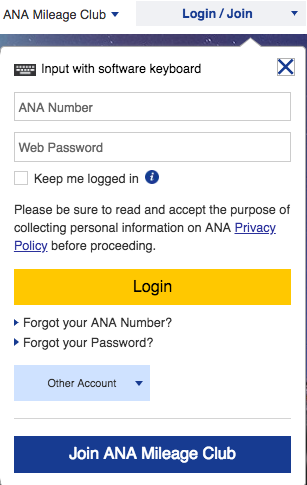 Go to the ANA homepage and enter your ANA number and password to log in to your account. ANA allows you to view 12 months of activity in your account. To view your account activity, log in, click the “Mileage Balance” tab on the right side of your account page, and then click “Miles” on the left side of your account page. ANA miles expire at the end of the 36th month in which the miles were earned. For example, if you earn ANA miles on September 16, 2018, the miles will expire September 30, 2021. The only way to extend the expiration of your ANA miles is to hold ANA Diamond member status. 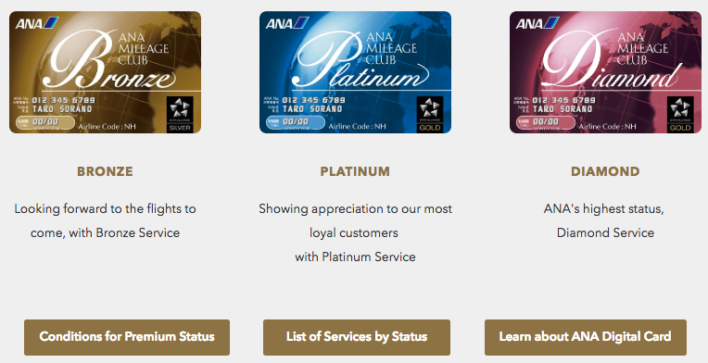 The ANA Mileage Club program has 3 status levels: Bronze, Platinum, and Diamond. The level of your elite status is determined by the amount of Premium Points that you earn over the course of a calendar year. If you’re interested in learning more about the elite benefits offered by ANA, here’s the link. ANA’s elite status is not as relevant for U.S.-based travelers as holding elite status is with a major U.S. airline. In order to receive the most value out of ANA elite status, you will need to be either a Japan-based flyer, or a regular flyer of ANA or Star Alliance flights to Japan. ANA uses a point system to qualify for elite status tiers. The points are called Premium Points, and they’re earned when flying ANA or Star Alliance partner flights between January and December. The airline miles and Premium Points you earn when flying are separate. Miles are based on your cabin class and the distance that you flew. Premium Points are based on a convoluted calculation and relate to your elite status. Basic segment mileage is the number of miles that you flew — pretty straightforward. Mileage accrual rate by booking class and fare type/rule is based on the type of airline ticket you purchased. All cabin classes typically have letters associated with the type of fare you’re buying, which translates into a certain percentage of miles that you will earn. Route Ratio is a multiplier based on the route. 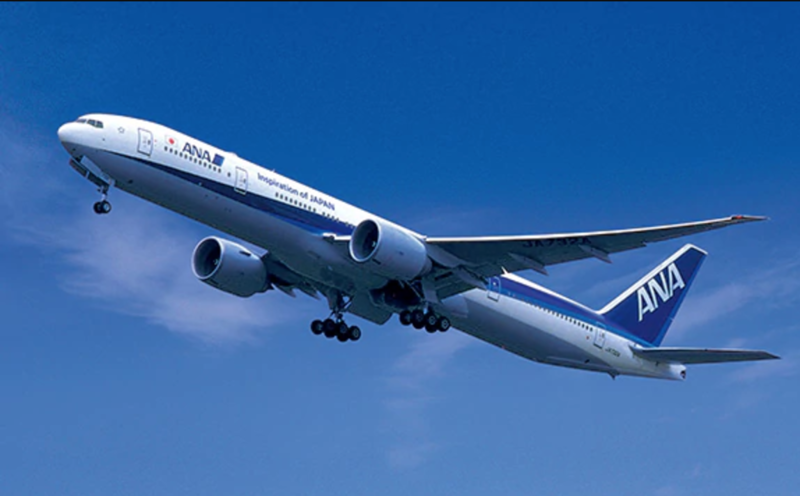 Domestic Japan flights earn 2x, ANA flights between Japan and Asia or Japan and Oceania earn 1.5x, and other ANA or Star Alliance flights earn 1x. Boarding Points are the points you earn based on your cabin class and type of airfare. ANA provides guidance on how many points you will earn here. To summarize, ANA awards flight miles and Premium Points, and the airline has a Premium Points Simulation to help you calculate the number of miles and points you will earn. Hot Tip: First National Bank of Omaha’s ANA credit card is a way to earn additional Premium Points that count toward your ANA elite status. ANA only has 1 co-branded credit card for U.S.-based travelers, so the best way to earn ANA miles is to look into the flexible point programs. Marriott and American Express are the flexible points programs that allow you to earn ANA miles by transferring those points directly to ANA. ANA awards what it calls “regular flight miles” by simply holding ANA elite status. If you fly on an ANA or a United Airlines-operated flight, you will also earn bonus miles based on your cabin class and fare type. The flight miles that you earn can then be used for award flights or upgraded benefits. Mileage will be determined by your elite status tier and the number of years you’ve had said elite status. In addition, you will earn 5% bonus miles for holding a co-branded ANA credit card. Bronze – 40% bonus miles during your first elite year; 50% bonus miles in year 2 continuing as long as you hold the status. Platinum – 90% bonus miles during your first elite year; 100% bonus miles in year 2 continuing as long as you hold the status. Diamond – 115% bonus miles during your first elite year; 125% bonus miles in year 2 continuing as long as you hold the status. By holding one of the credit cards listed on this page, you will increase your earn rates in each elite tier by 5%. For example, you will earn 45% bonus miles instead of 40% bonus miles during your first Bronze elite year if you have one of the credit cards listed in the link. The ANA miles you earn when flying on an ANA partner will be driven by the partner that you fly, the fare class, and the marketing carrier of the flight (codeshare). ANA offers a single co-branded credit card through First National Bank of Omaha that we don’t recommend. The card doesn’t come with a significant sign-up bonus, and the earning rates when spending on the card leave much to be desired. 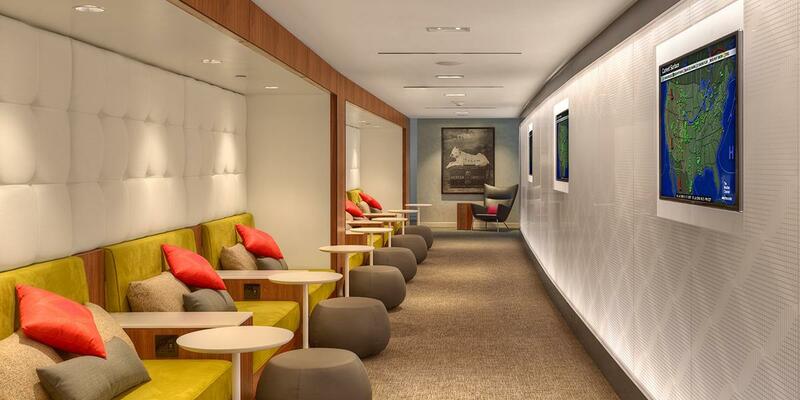 Instead, focus on earning Marriott and Amex points that can be transferred directly to ANA. Both partners offer a number of personal and business credit cards (Chase, Amex) that make it easy to earn enough points for a redemption. In addition to being in the Star Alliance and partnering with other airlines, ANA has non-airline partners like hotels and car rental companies. As you’ll see on its earning miles page, you can earn miles by spending with ANA’s hotel, car rental, mileage mall, restaurants, and retail partners. ANA uses 3 different award charts: one when flying ANA domestically within Japan, one when flying ANA or Air Japan internationally, and one when flying ANA’s partner airlines. The ANA and Air Japan domestic chart can be found here, the ANA international award chart here, and ANA partner award chart here. After you decide the dates that you want to fly, here are the round-trip mileage rates for travel to/from North America. ANA flies from Tokyo-Narita (NRT) to the following airports in the U.S.: Chicago(ORD), Houston (IAH), Los Angeles (LAX), New York (JFK), San Francisco (SFO), San Jose (SJC), Seattle (SEA), Mexico City (MEX), and Washington, D.C.(IAD). ANA also flies from Tokyo-Haneda (HND) to the following airports in the U.S.: Chicago, Los Angeles, New York, and Vancouver (YVR). Hot Tip: If you’re eyeing a trip to Japan and want to use your miles, we put together a piece on the best ways to redeem ANA miles. It’s important to note that all ANA and partner airline flights must be booked round-trip, except for ANA domestic flights. 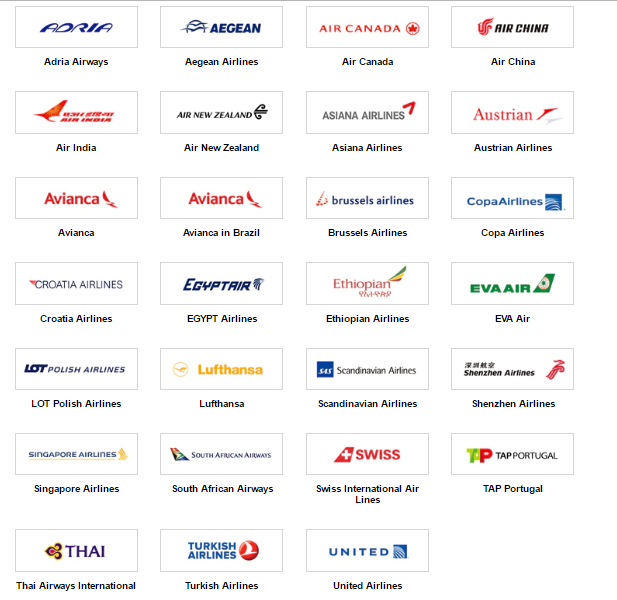 The best websites to search for Star Alliance availability (including ANA) are United, Aeroplan, and ANA. Each search engine has its drawbacks, but when used in combination, they can help you find the availability you’re looking for. United Airlines’ search engine is best to get a broad view of availability thanks to its month-long calendar. It’s also great that United doesn’t require you to log in to see award space. The drawback with United is that you’ll come across phantom award space, so it’s important to click through the entire booking process to confirm award availability. Also, United doesn’t organize award routes by the most convenient routing, so use the drop-downs on the left side of the search results to find your desired flights. Aeroplan is a great tool because it tends to be more accurate than United. The search engine is straightforward and allows you to easily search for the cabin class and route you’re after. Unlike United, you must log in to use the search engine. The downside is that Aeroplan only allows you to search availability 1 week at a time, and like United, the search results can be inaccurate. ANA is likely the least utilized website of the 3 because it takes the most time to learn. But once you learn how to use it, you’ll have access to more accurate award availability. The ANA search engine requires you to search round-trip or an open-jaw route, which makes it more difficult to use than being able to search one-way. The website also requires you to log in to search for award space. Hot Tip: If can’t find award space on the ANA website and the flights you want are showing on the United and/or Aeroplan website, call ANA at 800-235-9262. The agent can then search for the award space that you found and help you book the flight. In Mileage Club, who are the partners? Can I transfer miles to them? With ANA in the Star Alliance, you’ll be able to use ANA miles to fly on any of the airlines in the alliance. ANA also has separate airline agreements with airlines outside of the Star Alliance. The same structure works in that you can use ANA miles to fly these airlines. In addition to its airline partners, ANA has other travel partners including hotels and car rental companies. You can transfer miles to its non-airline partners, but this will not get you the best value for your miles. 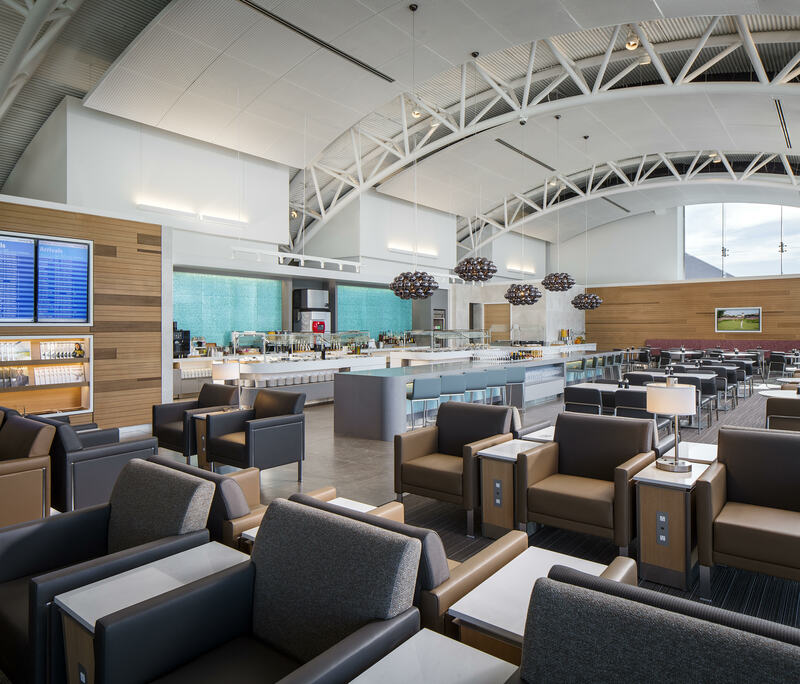 What is the ANA Mileage Club login? The ANA login page can be accessed here. Where can I sign up for Mileage Club? What is my Mileage Club number? After logging into your account, click the yellow “My Menu” tab and then click the “List your ANA Number” tab to see your ANA number. When did the ANA join the Star Alliance? ANA joined the Star Alliance in October 1999. When do miles post in Mileage Club? ANA does not list how long it takes miles to post into your account in its terms and conditions, but based on experience with legacy U.S. airlines, miles should post within 7-10 days. When do Mileage Club miles expire? Miles expire at the end of the 36th month after you have earned them. When does Mileage Club status expire? The number of premium points you earn between January and December each year determines your elite status for the following year. Elite status starts on April 1 of that year and is valid for 1 year. Is there an ANA credit card? Yes, but we do not recommend it due to the low sign-up bonus currently offered. In Mileage Club, what is a stopover? A layover of more than 24 hours on an international flight is considered a stopover. What is a Mileage Club hold? The ANA website states that award flight holds are not possible, but you may be able to find an agent willing to put your flight on hold for 24-48 hours.